As Carmelo Anthony says, there are some guys who say they want it in crunch time, and guys who actually want it. Russell Westbrook is the latter. After shooting just 3-for-8 in the first three quarters, Westbrook checked back in with 8:43 to go in the fourth quarter against the Miami Heat and proceeded to score 17 points on 6-for-7 shooting while adding 3 rebounds and 3 assists. With the Thunder leading just 74-71 when Westbrook returned, the Thunder point guard hit one of his patented elbow jumpers, really with no prior rhythm. Westbrook then created a push-ahead corner three-pointer for Alex Abrines, and Adams made an incredible swing pass from the middle of the lane into the corner for a Corey Brewer corner three a few possessions later. Westbrook hit another long jumper before finding Adams on a breathtaking roll to the rim. The pass hit Adams on the move, in stride, and the Thunder big man finished without stopping to gather himself, through a foul. That bucket was a part of Adams’ 24-point, 12-rebound performance, as Westbrook utilized his big man all game long to generate high percentage offense while the Thunder struggled to shoot the ball. 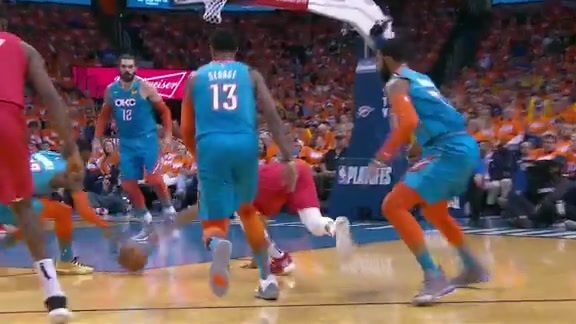 Adams missed the free throw after that rolling bucket, but Paul George corralled the rebound and dished to Westbrook, who Euro-stepped his way to the rim for a layup. As Westbrook imitated the move as an on-court instant replay going back up court, Miami was forced to call a timeout. “It doesn’t happen too often so you gotta make sure to show you exactly what happened so you don’t miss it,” Westbrook said a smile creeping over his face. That burst to make it 91-84 with 4:08 to go didn’t finish Miami, an Eastern Conference playoff squad, for good. In fact with 1:04 to go, the Thunder led just 97-95. Westbrook went left around an Adams screen and instead of taking the shot himself, dropped it off to Adams for a massive dunk to create separation, which George opened wider with an uncanny steal on Miami’s ensuing side out of bounds play. It was a play that only George, an NBA Defensive Player of the Year candidate, could make. 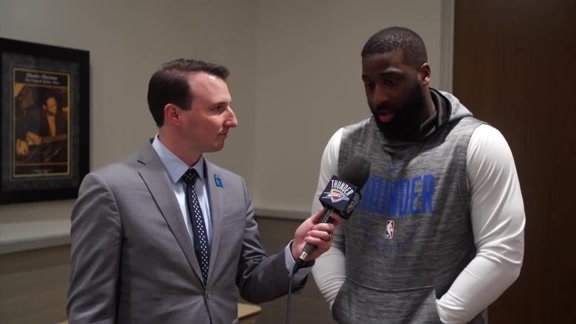 The Thunder forward, who had a rough shooting night, finished with a transition three-point play that sealed the deal, and resulted in a 105-99 Thunder victory. Head Coach Billy Donovan’s club, after shooting just 34.4 percent through three quarters, went 15-for-23 (65.2 percent) in the fourth and scored 41 points. Westbrook, who finished with 29 points, 13 rebounds and 8 assists, carried the torch down the stretch, but he actually had it handed to him by his fellow floor general, Raymond Felton. 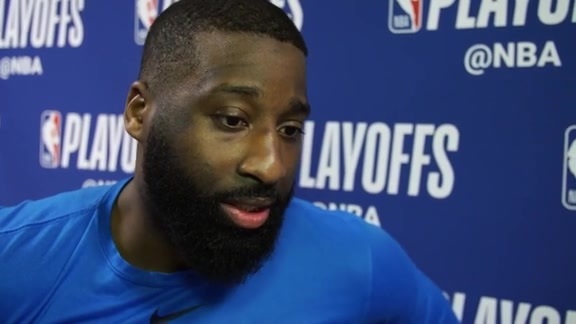 As a part of a 30-point effort by the ever-more-reliable bench unit, Felton scored 8 of his 10 points by knocking down a three-pointer, a pull-up shot in the lane and an and-one driving layup over the first three minutes of the fourth quarter to turn a five-point deficit into that 74-71 Thunder lead, which is when Westbrook checked back in. “We all feed off of each other,” Felton added. The steadying presence all night for the Thunder certainly wasn’t the volatile offense, but rather a focused, communicative defense that for the most part handled Miami’s funky, dribble-hand-off, five-out offense quite well. The Heat employ ball-handlers at all five positions for most of the game, and run its three-point shooting guards off chaotic screening actions out top relentlessly. Miami knocked down 13-of-30 three-pointers, but managed just 39.1 percent shooting from the floor in the game, and just 17-of-43 (39.5 percent) shooting in the paint.